Bangkok as the capital of Thailand, not only is the center of culture and economy, but also is a paradise for relaxing and enjoying. As a necessity for travelling, a comfortable hotel is very important. Here our specialist carefully selected the top 10 luxury hotels that each has its own style. Should I stay in Bangkok? As the capital and the largest city in Bangkok, the city offers a modern and variety type of accommodations for you. Mandarin Oriental, Bangkok as a hotel that has over 140 years of history has become the legend of all hotels because of its delicate hospitality management and luxurious decorations. Visitors can feel the warm atmosphere and receive friendly welcome the minute they arrive at Mandarin Oriental, Bangkok. It is the kind of luxury hotel you would expect and want to stay at. Take Tuk-Tuk or a taxi for 20 minutes and you can see world-famous attractions around the Grand Palace. 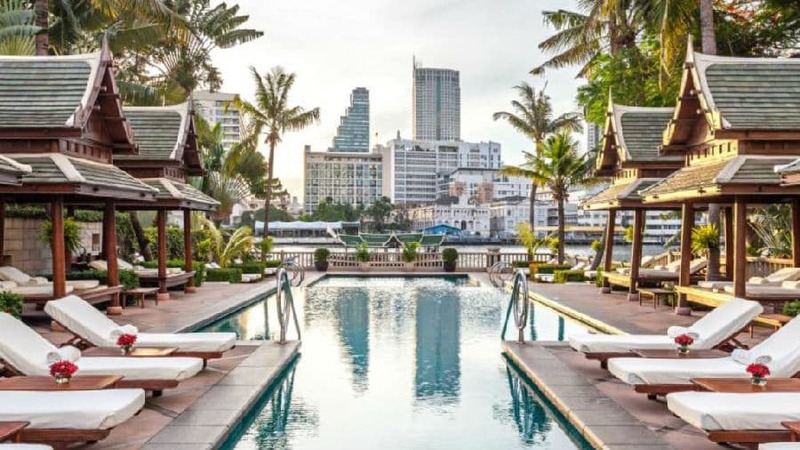 Mandarin Oriental, Bangkok offers free ferry service to connect guests to commuter ships at Sathorn Terminal, a main transportation hub. From here you can explore the landscape of the Chao Phraya river - the lifeblood of the city. 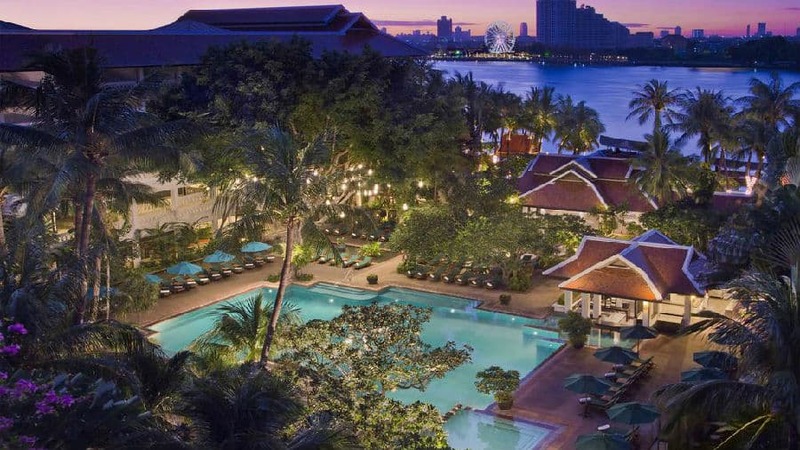 The Peninsula Bangkok is one of the best luxury hotels in Bangkok that is located on the bank of the Chao Phraya River. 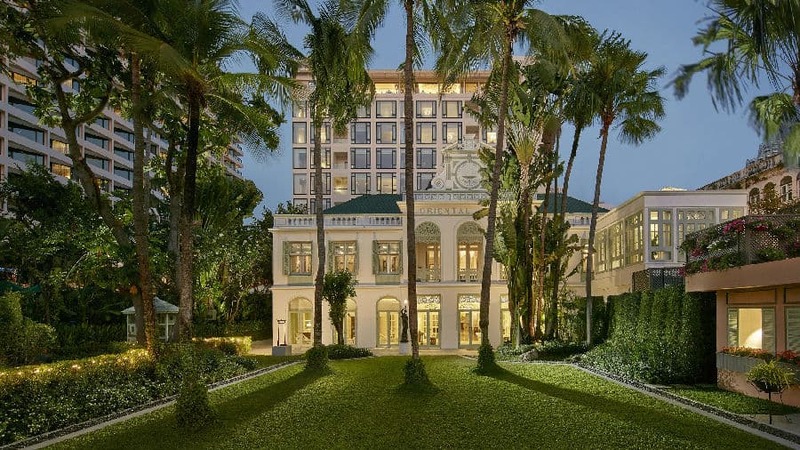 As a five-star luxury hotel, The Peninsula Bangkok combines both the western and eastern architectural styles. It provides 24-hour catering service and a magnificent pool. You are able to enjoy incomparable services here at The Peninsula Bangkok. 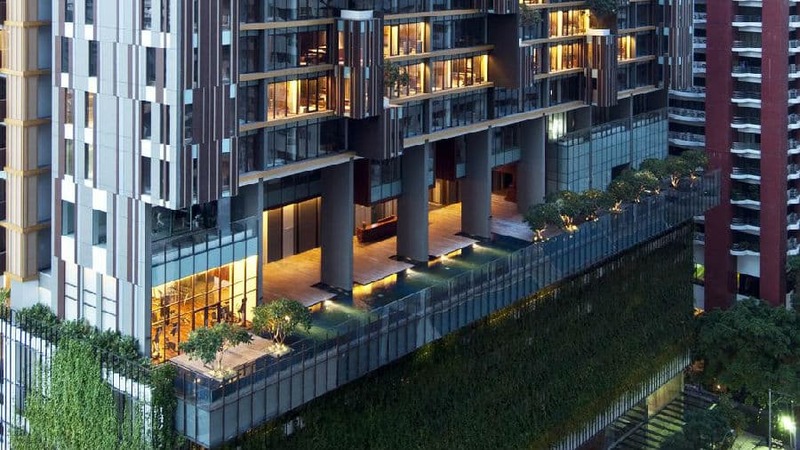 The Peninsula Bangkok is an urban oasis, located on the banks of the Chao Phraya River, is easily access to and from the business and shopping districts of the city. The four stylish shuttle boats of the property are available on demand between three piers. The trips - and the views - are free. Compare to a hotel, The Siam is more like a museum. 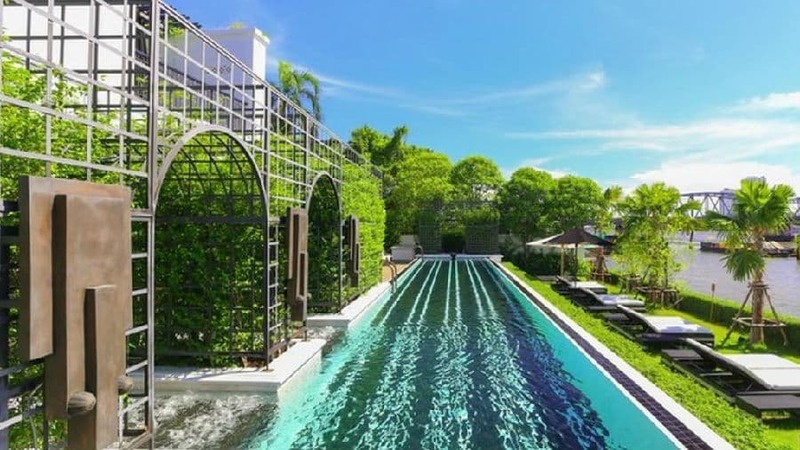 Its owner is a famous family in Bangkok called Sukosol, and they hire one of the most famous landscape architects in the world - Bill Bensley to design the entire hotel. There are only 39 rooms total in The Siam, so that they can provide their customers with a quiet and relaxing environment. The property provides free shuttle boat from the hotel to Bangkok's central Sathorn Pier from 10:00-23:00 hrs. 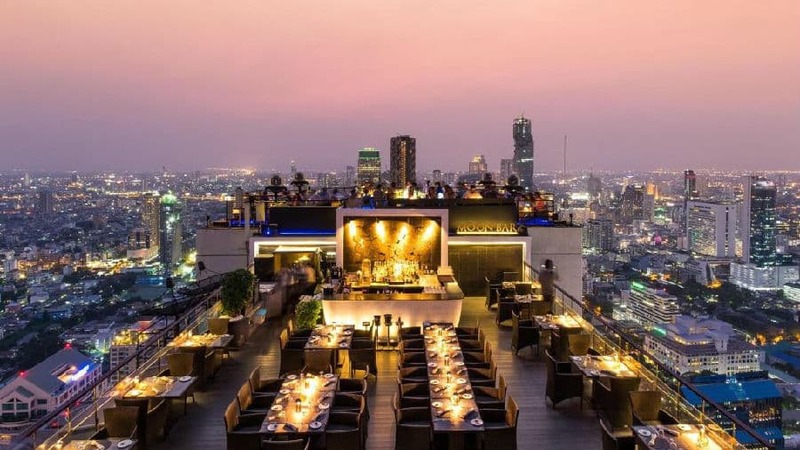 Banyan Tree Bangkok is another luxury hotel that is known for its Vertigo and Moon Bar on the top floor (61th floor). Its geographic location and great Spa win the favor of people from around the world. The property offers a new way to travel by TukTuk. This is a free service for the guests to Saladang skytrain station and Lumpini underground station. If there is no legendary tuk tuk, a real "stunning Thailand" experience, stay in Bangkok is not complete. The Sukhothai Bangkok is inspired by the old city Sukhothai; the main hall is surrounded by lotus ponds. Designers mix modern elements with Thai classic together and makes The Sukhothai Bangkok stands out within all the luxury hotels in Bangkok. With its convenient location, the property offers easy access to go the city's must-see destinations. 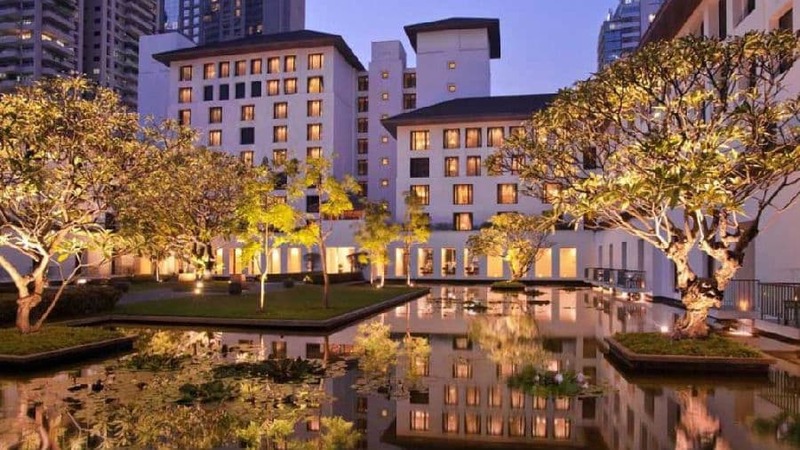 Anantara Bangkok Riverside is more like a resort than a hotel. As we can know from its name, it is located right by the Chao Phraya River. In addition to all the necessary amenities, it also provides cooking classes for visitor to learn to cook Thai food. It is a good opportunity to better understand Thai culture. A scheduled private boat shuttle takes guests to Saphan Taksin Skytrain station. 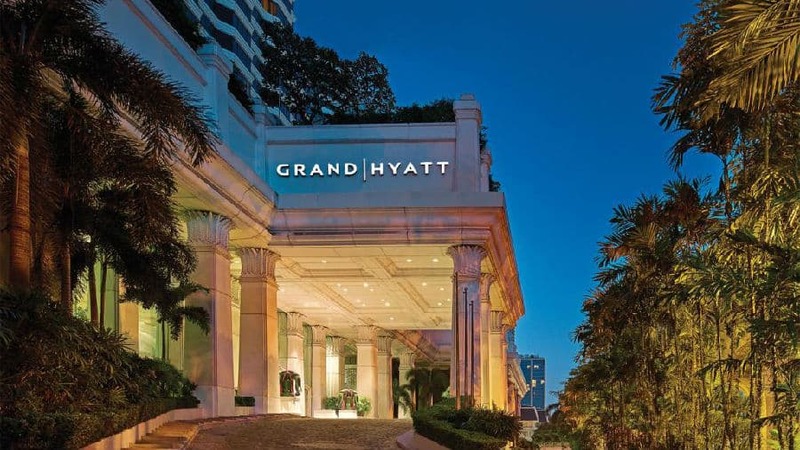 People who have lived in Grand Hyatt Erawan Bangkok before would never forget its white granite colonnades that line the entrance and lobby, which provide a sense of grandeur. Underneath its grandness is a feeling of relaxing and enjoying. If you are looking for a luxurious hotel in the center of Bangkok, Grand Hyatt Erawan would be a good one to consider. Strategically located in the commercial and leisure center of the city, the property is surrounded by premier shopping malls and offices, such as Gaysorn, Central World, and Siam Paragon. Hansar Bangkok Hotel is an exclusive boutique hotel with wonderful outlook, delicate suits, professional service, and great location. It is very close to Silom and Ploenchit business districts and Siam shopping area, and its style is perfect for business or leisure guests. Sited on Ratchadamri Road -one of Thailand's most desirable addresses –your stay will be fast and hassle-free. Ratchadamri BTS Skytrain Station is located just a stone's throw away and Silom MRT Subway Station is just a few minutes walk to reach. Metropolitan by COMO, Bangkok as a hotel that is in the Centre area, is well-known for its Thai restaurant - Nahm, which is oversaw by Michelin-level chef - David Thompson. Nahm is located on the first floor across the pool. Unlike others, Metropolitan by COMO is a modern style hotel, which makes it looks simple and clear. 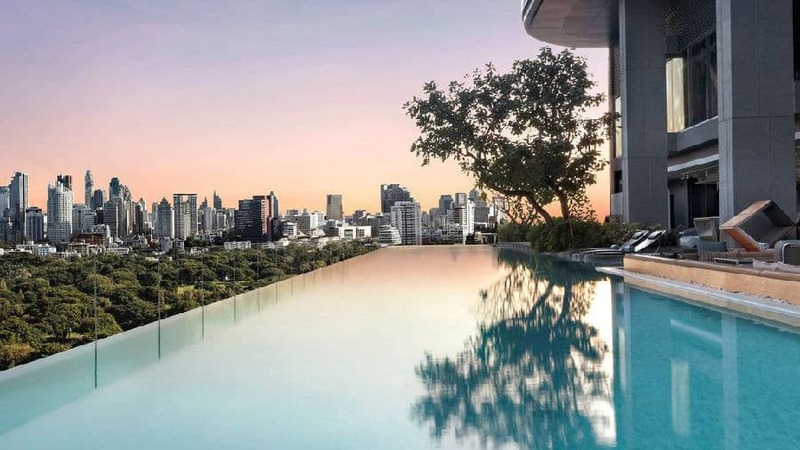 COMO Metropolitan Bangkok is an urban escape located in the central business district of Sathorn with a shuttle van service to the Saladaeng BTS Skytrain Station. Sofitel So Bangkok Hotel is a unique luxury hotel because it has 237 themed rooms and suites created around The Five Elements - Water, Earth, Wood, Metal and Fire. 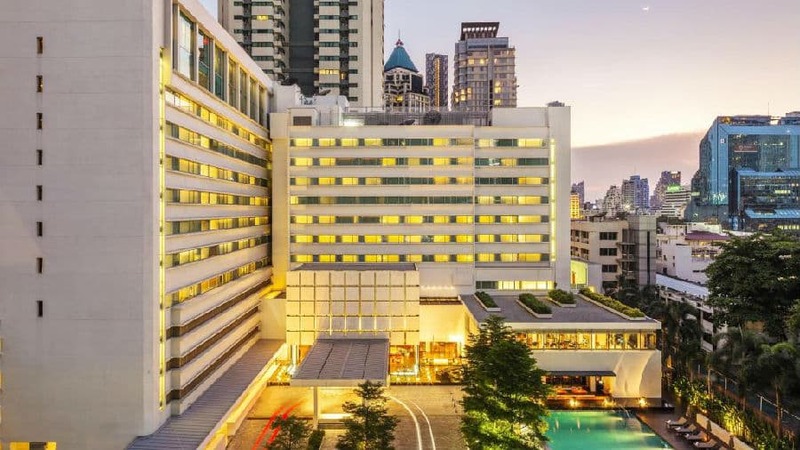 Sofitel So has three total in the world, and one of them is in Bangkok, so if you are interested in those designs, definitely try Sofitel So Bangkok Hotel. Free use of bicycles, bike rental and car rental are available at this property to nearby Sala Daeng BTS skytrain and Lumphini MRT subway stations. The area is popular for biking, with an easy access to main attractions and shopping areas.